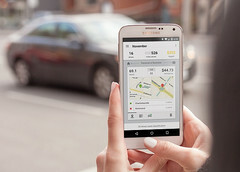 The latest acquisition of the Redmond giant is well known for the popular MileIQ app, which has over 1 million users and has been the leader of the finance app category in iTunes for almost two years. Mobile Data Labs was born less than three years ago, but their MileIQ app quickly became a top seller in the finance app market. This smart mileage tracking app is available for both Android and iOS, has more than 1 million users, and managed to stay on top of the finance category in iTunes for almost two years. This week, Mobile Data Labs Inc. joins Microsoft "to advance intelligent productivity solutions for the mobile workforce." According to Corporate Vice President of Outlook and Office 365 Rajesh Jha, this corporate acquisition "is the latest example of Microsoft’s ambition to reinvent productivity and business process in a mobile-first, cloud-first world." Mobile Data Labs' MileIQ app uses the sensors present in modern mobile devices to capture, log, and calculate business miles, so its users can claim tax deductions properly. The average MileIQ subscriber can deduct $547 USD a month in business miles, reveals Rajesh Jha's blog post. In the future, the Mobile Data Labs team will work on mobile productivity solutions, taking advantage of insights from Office 365 and the Office Graph. As usual, the financial terms of the deal have not been disclosed.